The last quarter of the 20th century has seen the development of a new economic power for states. The organized travels of masses have formed a new industry: tourism. When tourism has become one of the most important and innovative element in the economic growth of states, the need to organize and regulate tourism-related matters has also become vital. Hence, this demand has transformed itself into an inter-governmental organization i.e. World Tourism Organization. In fact, before its establishment, there was a non-governmental organization in this field, and with the help of the United Nations this organization has turned itself into World Tourism Organization. Apparently, despite its prominence, the World Tourism Organization has been neglected. The indications of this negligence can be seen either in the number of its member states, particularly comparing it to the other specialized agencies or in the misleading information about its real status in the global media. Nevertheless, this article contains a short description of a deviated specialized agency, which is World Tourism Organization, and also includes the brief history of its establishment, the features of its membership, the main structure of the organization, its legal status, and its relation with the United Nations, as well. Furthermore, this organization represents one of the most influential transformations in the whole history of international institutional law. 20. yüzyılın ikinci yarısı, devletler için yeni ekonomik gücün gelişimine şahitlik etmiştir. Kitlelerin örgütlü seyahatleri yeni bir sanayi doğurmuştur: turizm. Turizm devletlerin ekonomik büyümesindeki en önemli ve yenilikçi unsurlardan bir hâline geldiğinde, turizm ile alâkalı konuları örgütlemek ve düzenlemek de önemli hâle gelmiştir. Böylelikle, bu ihtiyaç kendisini Dünya Turizm Örgütü olarak hükûmetler-arası bir örgüte dönüştürmüştür. Gerçekte, kurulmasından evvel, bu alanda hükûmetler dışı uluslararası bir örgüt vardır ve bu örgüt Birleşmiş Milletler’in de yardımıyla kendisini Dünya Turizm Örgütü’ne çevirmiştir. Önemine rağmen, görüldüğü üzere, Dünya Turizm Örgütü kendi çapında ihmal edilmiştir. Bu ihmal edilmişliğin göstergesi, gerek özellikle diğer uzmanlık örgütleriyle mukayese edildiğinde üye sayısının azlığında, gerek gerçek statüsü hakkında global medya organlarında çıkan yanıltıcı bilgilerde gözlemlenebilir. Bununla birlikte, bu makale, büyük öneme sahip nadir bir uzmanlık örgütünü, Dünya Turizm Örgütü’nü kısaca tariflemekte, öz bir biçimde kuruluş tarihçesini, üyeliğe ilişkin özelliklerini, örgütün ana yapısını, hukukî statüsünü ve aynı zamanda Birleşmiş Milletler ile olan ilişkisini içermektedir. Dahası, bu örgüt tüm uluslararası kurumsal hukuk tarihindeki en etkileyici dönüşümü de temsil etmektedir. ARCHER C., International Organizations, 3rd edition, London, 2001. BEN-ARI R.H., The Legal Status of International Non-Governmental Organizations: Analysis of Past and Present Initiatives (1912-2012), Leiden, 2013. BLANCHFIELD L. & BROWNE M.A., Membership in the United Nations and Its Specialized Agencies, Congressional Research Service, June 19 2014 via https://fas.org/sgp/crs/row/R43614.pdf (ziyaret tarihi: 30/08/17). CASTAÑEDA J., Une nouvelle méthode pour le création d’organismes internationaux: le cas récent de l’U.I.O.O.T., Annuaire français de droit international, vol. 16, 1970, s. 625-632. DAVIES M. & WOODWARD R., International Organizations: A Companion, Padstowe, 2014. FELDMAN D., International Personality, Recueil des cours, vol. 191, 1985-II, 1985, s. 343-413. GEE C.Y. & FAYOS-SOLÁ E. (eds. ), International Tourism: A Global Perspective, Madrid, 1997. 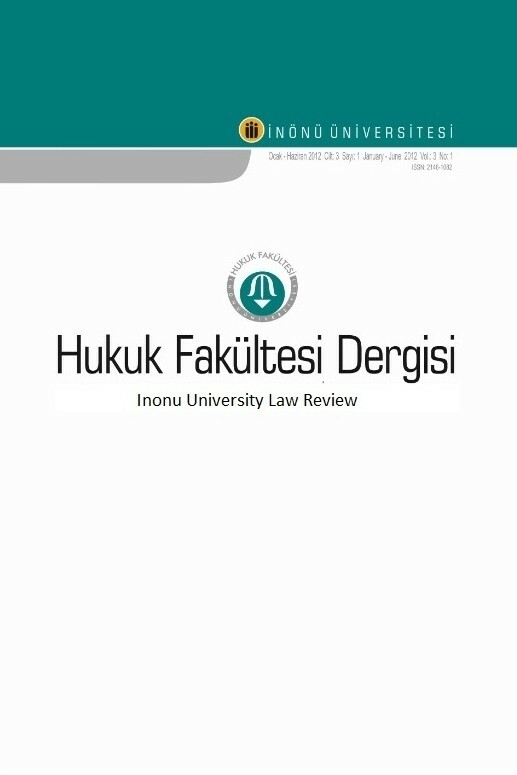 GILMOUR D.R., The World Tourism Organization: International Constitutional Law with a Difference, Netherlands International Law Review, vol. 18/3, 1971, s. 275-298. GRANT J.P. & BAKER J.C., Parry and Grant Encyclopædic Dictionary of International Law, 3rd edition, New York, 2009. HÜFNER K., Specialized Agencies, in A Concise Encyclopedia of the United Nations, 2nd revised edition, edited by Volger, Leiden, 2010, s. 670-675. KLEIN E., United Nations, Specialized Agencies, Encyclopedia of Public International Law: International Organizations in General-Universal International Organizations and Cooperation, vol. 5, edited by Bernhardt, Amsterdam, 1983, s. 349-369. KLEIN E., United Nations, Specialized Agencies, Max Planck Encyclopedia of Public International Law, on-line edition, edited by Wolfrum, August 2006 via http://opil.ouplaw.com/view/10.1093/law:epil/9780199231690/law-9780199231690-e562 (ziyaret tarihi: 01/07/17). LINDBLOM K., Non-Governmental Organizations in International Law, Cambridge, 2005. MAGLIVERAS K.D., Membership in International Organizations, in Research Handbook on the Law of International Organizations, edited by Klabbers & Wallendahl, Surrey, 2011, s. 84-107. OPPENHEIM L., International Law: A Treatise, vol. I (Peace), London, 1912. PAZARCI H., Uluslararası Hukuk Dersleri, II. Kitap, Gözden Geçirilmiş 6. Baskı, Ankara, 1999. PAZARCI H., Uluslararası Hukuk, 14. Baskı, Ankara, 2015. PEASLEE A.J., International Governmental Organizations: Constitutional Documents, revised 3rd edition (Part V-Communications-Transport-Travel) , The Hague, 1976. PORTMANN R., Legal Personality in International Law, Cambridge, 2010. SCHECTER M.G., Historical Dictionary of International Organizations, 2nd edition, Lanham, 2010. SCHERMERS H.G., International Organizations, in International Law: Achievements and Prospects, edited by Bedjaoui, Paris, 1991, s. 67-100. SCHERMERS H.G. & BLOKKER N.G., International Institutional Law: Unity within Diversity, 5th Revised Edition, Leiden, 2011. SCHIAVONE G., International Organizations: A Dictionary and Directory, 7th edition, New York, 2008. SUR M., Uluslararası Hukukun Esasları, 9. Baskı, İstanbul, 2015. SZAZI E., NGOs: Legitimate Subjects of International Law, Leiden, 2012. TABORY M., The Addition of Arabic as an Official and Working Language of the UN General Assembly and at Diplomatic Conferences, Israel Law Review, vol. 13/3, 1978, s. 391-410. TURNER E.A.L., Why Has the Number of International Non-Governmental Organizations Exploded since 1960?, Cliodynamics: Journal of Theoretical & Mathematical History, vol. 1(1), 2010, s. 81-91 via http://escholarship.org/uc/item/97p470sx (ziyaret tarihi: 08/09/17). “UNWTO Basic Documents”, vol. I (Statutes/Rules of Procedures/Agreements), 5th edition, Madrid, Febuary 2016 via http://cf.cdn.unwto.org/sites/all/files/docpdf/130718basicdocumentsenweb.pdf (ziyaret tarihi: 28/08/17). VELLAS P., Tourism, Encyclopedia of Public International Law: International Relations and Legal Cooperation in General-Diplomacy and Consular Relations, vol. 9, edited by Bernhardt, Amsterdam, 1986, s. 376-378. VOLGER H., UNWTO-World Tourism Organization, in A Concise Encyclopedia of the United Nations, 2nd revised edition, edited by Volger, Leiden, 2010, s. 838-840. VRANCKEN P., Tourism, Max Planck Encyclopedia of Public International Law, on-line edition, edited by Wolfrum, February 2011 via http://opil.ouplaw.com/view/10.1093/law:epil/9780199231690/law-9780199231690-e1001 (ziyaret tarihi: 01/07/17). WALTER C., Subjects of International Law, Max Planck Encyclopedia of Public International Law, on-line edition, edited by Wolfrum, 2008 via www.mpepil.com (ziyaret tarihi: 05/04/08).